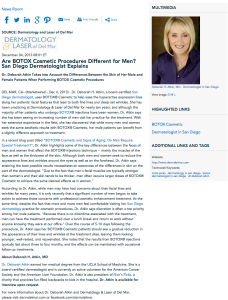 Dr. Deborah Atkin takes into account the differences between the skin of her male and female patients when performing BOTOX® Cosmetic procedures. 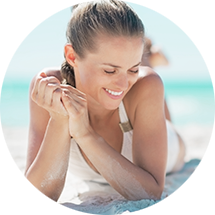 Del Mar, CA – Deborah H. Atkin, M.D., a board-certified San Diego dermatologist, uses BOTOX® Cosmetic to help ease the hyperactive expression lines along her patients’ facial features that lead to both fine lines and deep-set wrinkles. 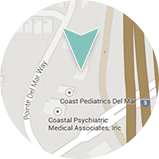 She has been practicing at Dermatology & Laser of Del Mar for nearly ten years, and although the majority of her patients who undergo BOTOX® injections have been women, Dr. Atkin says she has been seeing an increasing number of men visit her practice for the treatment. With her extensive experience in the field, she has discovered that while many men and women seek the same aesthetic results with BOTOX® Cosmetic, her male patients can benefit from a slightly different approach to treatment. According to Dr. Atkin, while men may have had concerns about their facial lines and wrinkles for many years, it is only recently that a significant number of men began to take action to address those concerns with professional cosmetic enhancement treatment. At the same time, despite the fact that more and more men feel comfortable visiting her San Diego dermatology practice for cosmetic procedures, Dr. Atkin says discretion is often a top priority among her male patients. “Because there is no downtime associated with the treatment, men can have the treatment performed over a lunch break and return to work without anyone knowing they were at our office.” Over the course of 5-10 days following the procedure, Dr. Atkin says her BOTOX® Cosmetic patients should see a gradual reduction in the appearance of their lines and wrinkles at the treatment sites, leaving them looking younger, well-rested, and rejuvenated. She notes that the results from BOTOX® injections typically last about three to four months, and the effects can be maintained with occasional follow-up treatments. Dr. Deborah Atkin earned her medical degree from the UCLA School of Medicine. She is a board-certified dermatologist and is currently an active volunteer for the American Cancer Society and the American Liver Foundation. Dr. Atkin is also president of Nick’s Picks, a charity that provides fun-filled backpacks to kids in the hospital. Dr. Atkin is available for interview upon request.